Well, submitting all those pages and pages of application paid off. I just learned that I've been accepted to the Summer/Fall semester of the Vermont College Masters in Fine Arts, Picture Book session! Late this evening I checked my phone messages -- and there was a message from the Head of the program welcoming me. Later still, I opened my e-mail to find that I had gotten written notification, too. First reaction is thrills and excitement. Second reaction is the realization == what have I gotten myself into? I'll learn the details about that later. Right now I'll stay with the happy excitement. I'm beginning to see why other writers give prizes (copies of their books) to people who leave comments on their blog. I actually won a book myself just because I had left a comment. Since I'm also a librarian and actually have too many books (is there such a thing as too many books? ), I suggested she not send it to me, but to donate it to a needy library somewhere else. After a while of blogging and not getting comments, you kinda assume that you are writing in a private journal. That's okay. I"m often using this blog as a journal. For example, blogging while I'm at a conference helps me get my notes in order -- I have to write reports when I get back to work explaining what I learned. I've found that getting the conference notes down in a blog makes those reports so much easier to write. Now, I fully intend to give prizes to people that comment to messages, myself. However, you'll have to wait for them. Next Fall, during the weeks leading up to Halloween, I'll be awarding copies of my latest Halloween book to some lucky people. It might be you. Oh dear, libraries are closed today and I have no nonfiction book here at home to review. Please jump on over to Marc Aronson's wonderful nonfiction blog -- Nonfiction Matters -- and enjoy what he has to say. Meanwhile, links to the other Nonfiction Monday blogs are all gathered here. Here is the actual time it took Jane Yolen, the award-winning writer of about 300 books, to write a picture book. It is probably the fastest time ever -- from first thought to purchase. Please note the number of revisions. The rest of us writers need months or several years to refine a picture book into publishable form. "Good news first: Sold a new picture book with daughter Heidi: NOT ALL PRINCESSES DRESS IN PINK to Alexandra Cooper at S&S. Alex and I were chatting in her office several months ago, and as I was leaving, I asked her if she had any books she longed to see. She mentioned a few ideas, and one--with a sigh--was: "I am so tired of princesses in pink." "Well," I responded, as I walked out the door, "Not all princesses dress in pink.” We grinned at one another. We both heard its possibilities. “I'll see what I can do," I added. At dinner that night, I told Heidi (her daughter) what Alex had said. And before you could say "Princesses in Pink" ten times fast, we had a first verse. Two months and seventeen full revisions later, we sold the book to Alex. That was speedy for us. Take that, Mrs. Bush and Jenna!" Oh dear. My pink-loving, 8-year old princess is going to be crushed to learn that Not all Princesses Dress in Pink. Some weeks I post a lot of messages and some weeks I'm busy, busy and have to make the effort to get two done. This week was one of those busy, busy ones. (Besides the fact that I caught the 8 year old's cold.) I worked two split days -- mornings and evenings. Visited a school to talk about books and the Summer Reading Program at the library. The kids there did ask me about my own books, but I was good and kept focused on library stuff. (mentioned they could look me up in their OPAC to see what books of mine their own library had.) Plus worked on nitty gritty library stuff like material assessments. But today, Friday, I have the day off. Which means I work the Saturday of what to the rest of you is a three-day weekend. But it also means that I have a 2 day weekend AND a day off on Friday. Yea! And the pool opens on Saturday! Brrrrrrrrr. It won't be anywhere near 80 degrees until Monday and even then the pool water will be freezing. Which probably won't bother the kids, but you won't see me in that pool until the sun warms it in July. And you won't believe the shocking things Monday's blog discusses about presidential candidates. And I probably won't be reviewing a nonfiction book tomorrow because I'll be doing a "Babies Love Books" program Monday morning, then preparing for a School Visit on Tuesday. No, not as an author. This is part of my job as a Children's Librarian in a public library system. We all go to the local schools and talk up the Summer Reading Program (Bugs, Bugs, Bugs!) and also suggest great new books the kids could read to reach their summer goal of reading 10 books. Maryland has joined the National Summer Reading Program and the theme this year is Insects -- CATCH THE READING BUG! We're even going to have a butterfly cage where caterpillars turn into butterflies before your very eyes. I can't wait. Just opening the boxes of Summer Reading Program supplies gives me a thrill -- it's just like Christmas. 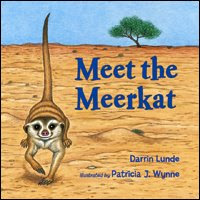 MEET THE MEERKAT, by Darrin Lunde, illustrated by Patricia J. Wynne, Charlesbridge, 2007, available now. If you were intrigued by Simba's friend, Timon the Meerkat, and you are a first or second grader, you will love finding out more about this African animal by reading this book. For example, when asked by the narrator, "what do you look like?" the meerkat pictured says, "I am long and thin. I have a pointy face. I am the size of a squirrel." Who knew? The meerkat on stage with the Lion King cast is the size of a large boy or small man. The text drew me in with this question and answer format -- telling me exactly what I wanted to know about this animal. The large pictures are inviting. The large typeface encourages young readers. And the information is just enough for a beginning reader's report on this animal. 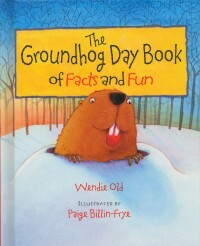 The author's afterward is not aimed at adults. It is still aimed at the young reader, giving them a little bit more information. Both the author and the illustrator, a husband and wife team, work for the American Museum of Natural History in New York City. For more Nonfiction Monday blog posts, click on the link in the previous message. Nonfiction Monday will show up on Tuesday, due to the fact that I forgot to bring my nonfiction book home from the library. Happy Mother's Day. I have posted your book review and our interview. 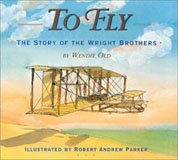 I am excited to welcome acclaimed children’s author Wendie C. Old this week to talk about her book on a family’s experience with Sudden Infant Death Syndrome (SIDS) titled, STACY HAD A LITTLE SISTER. It's really gratifying when someone asks you to talk about one of the first books you got published. The 8-year old had made a beautiful bracelet that matched a necklace I owned already. The reason the 35-year old had to e-mail me? Because the 8-year old was having her piano recital during the time she had her plane layover and she knew that I'd have my phone turned off. The piano recital was lovely. What a relief that the 8-year old played her piano pieces straight -- without the additional frills she wanted to do. We've promised her that she can noodle around on the piano all she wants, now that the recital is over. We won't talk about the pouring rain and the flood watch. Nor the flow of fire engines (even one from Pennsylvania) that screamed their way past the recital hall, on their way to evacuate a smoke-filled nine-story building full of elderly people who had to be helped down the stairs and taken elsewhere overnight. She Touched the World, Laura Bridgman, Deaf-Blind Pioneer. 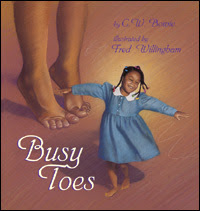 Written by co-authors, Sally Hobart Alexander and Robert Alexander. Clarion Books, 2008. This book couldn't have been better timed. I had hung on to the last copy of the previous Lara Bridgman biography long after it should have been withdrawn, simply because there was no other title to replace it. Last month I finally gave in and withdrew Child of the Silent Night. I hated to do it, but it was time. Imagine my astonishment, surprise, joy when this book appeared in the bag of new books delivered to my library branch. Hurrah! Some brave soul has also realized that we needed a new biography of the very FIRST deaf/blind child to learn to communicate. This biography clearly explains how scarlet fever robbed Laura of almost all of her senses except for touch. What a lonely and empty world she found herself. 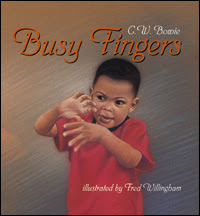 By the time she learned to fingerspell, she was full of questions and became a demanding chatterbox. She bubbled with energy and loved jokes. The author is herself a deaf/blind writer, but her life in the 21st century is easier than Laura's. The book's last chapter points out the new laws, improvements in medicine and changes in attitude toward the disabled. She and her husband co-wrote this book. I'm very glad to see this new Laura Bridgman biography. Available now. This week was mostly a writing week. Mailed off four manuscripts to publishers. Well, actually one manuscript to two publishers on Monday and another manuscript to two more publishers on Friday. All nonfiction Children's books. I feel very accomplished. I joined three other authors on a panel discussion at Harford Community College. It was fascinating to learn how the others worked and thought. One professor of literature who wrote poetry. One who wrote biography. One home security expert who also has a novel in the works. And me -- the children's book writer. But writing is writing and our creation processes were similar. The audience consisted of writers and readers and all had great questions. After doing two talks about writing this month, I'm all primed to offer writing advice. Please do drop a note in the comments section with your writing question and I'll try to answer it in the blog. I'm with a group of writers and one of them proudly states -- "My book has been accepted by PublishAmerica!" All I can do is cringe. Again and again that publisher's name comes up among beginning writers. Oh,(they say), it's so difficult to get published by the main publishers, but PublishAmerica accepted me. Well, honey -- they accept most everything sent to them. (Even tho they say they don't.) I think I heard that they even accepted a manuscript for a novel that a group of writers wrote using all the worst examples of writing they knew. Is it so difficult to research bad publishers? Okay, here's Writer Beware’s "Two Thumbs Down" Publishers List. And one specifically about Publish America's tactics here. Once you've read that information, do go to the Writer's Beware webpage (a link to it is on that blog) and read why. I've kinda given up trying to explain to writers why publishing with a bad publisher is worse than not getting published at all. Writers using these publishers just don't want to hear it. Besides the fact that Money should Flow TO the writer -- writers should NOT pay anything to the publisher -- these bad publishers also do not fulfill the promises they make. Some of them get sued by writers who have discovered what normal publishers actually do. Most professional writers treat writing as a business. Writers have a product -- their writing. They tell a good story or present nonfiction in an interesting way. Publishers pay them for the right to publish and distribute their product. Writers get an advance when the book is accepted and royalties as long as it is in print. Writers work with the editor to make it the very best book possible. They work with the marketing department to promote the book. Many writers earn a living at this. Money flows to the writer. Many others use this as a second job, keeping their day job.